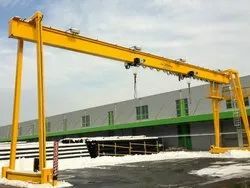 Creating a niche of EOT Crane such as Double Girder EOT Crane and Single Girder EOT Crane at its best, with utmost quality. All our offered products are mounted with anti-friction bearings on the 'L' type bearing housings so as to provide simple and reliable operations. We 'Smaco Engineering Pvt. Ltd.', established in the year 1988, we are among the prominent manufactures, suppliers & exporters of EOT Crane, Goliath Crane and Jib Crane. These are developed by a team of qualified professionals using superior quality components and raw material. Available in different sizes and specifications, all our products are ensured for their quality as these are designed and made in tandem with international quality norms. These products are renowned for their high performance, abrasion resistance and durability. Our exporting countries are East Asia, Middle East, South East Asia and Indian Subcontinent. We are ISO CERTIFIED. Our offered range of machines is highly acclaimed among the clients for its robust construction, corrosion resistance, simple functioning and optimum performance. We follow a standardized production process so as to maintain high quality for all the products, providing customized solutions as well. Our offered storage systems are acclaimed for their excellent storage capacity, rugged construction and simple operations. All our products find their extensive application in government & private sector firms, refineries, nuclear power plants and industries like pharmaceutical, chemicals & textile. We are engaged in offering EOT Crane that is known for optimum tolerance capacity, high tensile strength and robustness. 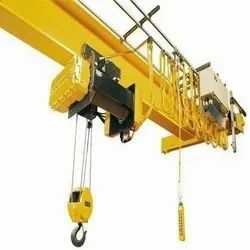 Our EOT Cranes are manufactured using high-grade material and technologically advanced machinery. These products are manufactured using excellent quality raw material by employing latest machines and tools.